Discover use cases of the Salesforce CRM. Understand how you can use Salesforce. Explain the value of the customer success platform. Salesforce gives you a 360 degree view of your customers and insight into your own business. If you’ve been running your business from multiple systems, it’s likely that your customer data lives in different places. You might have data in emails, spreadsheets, various databases, or point solutions. Multiple systems are a barrier to understanding your data and getting a complete picture of your customers. With your data in Salesforce, you have a single source of truth and a single point of engagement. Salesforce technology is a game-changer. It’s a single place to create, view, and update your customer data from anywhere on any device to drive lasting engagement with your customers. You don’t have to install software to access Salesforce. You just need an internet connection and a Web browser. But standard products and features are only the beginning. Our platform allows you to customize and personalize the experience for your customers, partners, and employees and easily extend beyond out of the box functionality. So where does CRM fit in to all of this? Let's start by defining what CRM is. Salesforce organizes your data into objects and records. Think of an object as a tab on a spreadsheet, and a record like a single row of data. But unlike a traditional spreadsheet, the data is stored in our trusted, secure cloud. Our easy-to-use interface lets you access it from your desktop and mobile device. You can easily import your data into Salesforce using point-and-click tools. Salesforce comes with standard objects already set up and ready for use. Here are some of the core standard objects, and a description of how each one is used. We’ll dive into these objects in greater detail as you work toward your badge for this module. Accounts Companies you’re doing business with. You can also do business with individual people, like solo contractors, using Person Accounts. More on that later. Contacts People who work at a company you’re doing business with (Accounts). Leads Potential prospects who are not yet ready to buy or you haven't determined what product they need. You don't have to use Leads, but they can be helpful if you have team selling, or if you have different sales processes for prospects and qualified buyers. 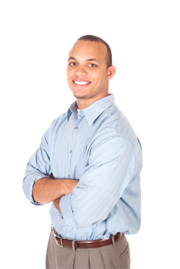 Opportunities Qualified leads that you’ve converted. 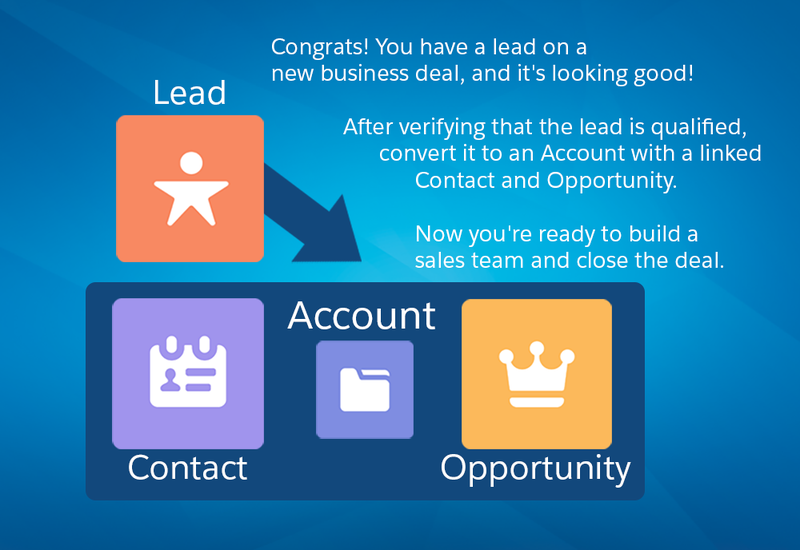 When you convert a lead, you create an Account and Contact along with the Opportunity. The Salesforce CRM allows you to manage and access your data in sophisticated ways that you could never do with a simple spreadsheet. Your records can be linked together to show how your data is related, so that you can see the whole picture. Take a look at how it fits together. And if you’d like to go deeper, check out the Trailhead Data Modeling module to learn more about how your data is organized. So that’s the basics of the standard object model. But what you have access to use depends on which editions and products you purchase. 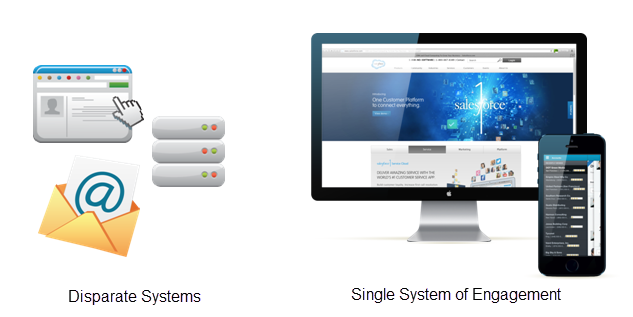 Salesforce features are available by purchasing products and editions. What you buy depends on what you need. You can visit this page for a deeper dive: www.salesforce.com/products. After you decide which product you need, you can select which edition to buy. It’s important that you understand that the edition you use determines what features you can access. Each edition is priced differently and contains different sets of features. For example, if you’re a Sales Cloud customer, Territory Management is only available in Enterprise and Unlimited editions. To learn more, check out this list of features available in different editions of Sales Cloud. Using the Salesforce mobile app, you can access your core CRM data and custom apps right from your mobile device. It’s also a mobile platform that you can use to build mobile-ready apps for your employees or customers. So how do you get access to the Salesforce app? The Salesforce app is available for most Salesforce editions and many user license types. If the Salesforce app is enabled, users can access it by getting the Salesforce for Android or iOS from Google Play or the App Store and then logging in to the mobile app with their regular login and password. If you haven’t checked out the Salesforce app yet, download the app and log in with your Developer Edition (DE) credentials that you use to log in to Trailhead. Now let’s put it all into practice using a customer story. Congratulations! You are the founder and CEO of an exciting company, Cloud Kicks. Cloud Kicks makes stylish and comfortable custom sneakers, designed and personalized for your customers. Your custom sneakers are a hit with celebrities, professional athletes, and people who attend a certain popular tech conference in San Francisco. Cloud Kicks sells to consumers and businesses alike, and although you’ve only been in business for less than a year, you’re already exceeding your targets and thinking about expanding your base of operations. But no company is a success without an amazing team, and the Cloud Kicks team is small but mighty, with their efforts powered by the Salesforce customer success platform. Here are some of the key players at Cloud Kicks who use Salesforce. So how does Cloud Kicks succeed with Salesforce? Candace was born to sell. She crushes her number every month, sets an amazing example for the rest of the team, and is currently mentoring two new salespeople. How does she do it? Candace’s motto is: If it’s not in Salesforce, it doesn’t exist. She tracks everything related to her prospective customers using Leads and Opportunities in Salesforce. She has a lead for each prospect, and when she’s qualified them to buy, she converts that lead to an opportunity. Keeping leads and opportunities separate allows Candace to focus her energy on deals she’s most likely to close, and it helps her manage her sales quota. Each lead and opportunity in Salesforce is Candace’s single source of truth for her relationship with her prospects and customers. It’s where she tracks everything, including meetings, emails, phone calls, and notes. Linda is the Salesforce administrator for Cloud Kicks. She is your company's trusted advisor for Salesforce and supports the entire Cloud Kicks sales organization. How does Linda succeed? 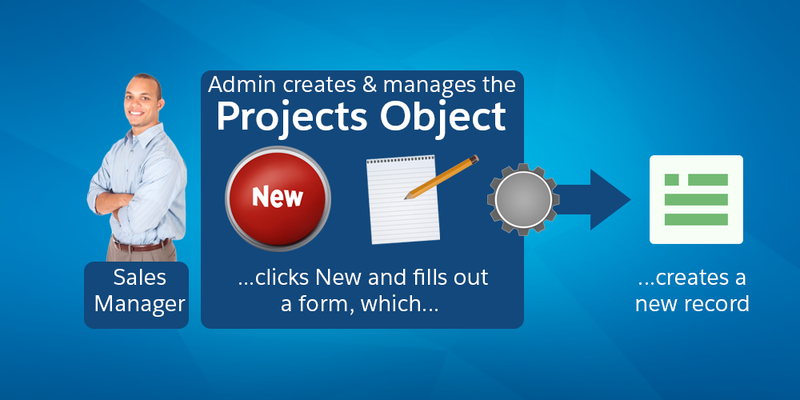 She created a custom object in Salesforce (more on custom objects in just a bit) to manage incoming project requests from end users to stay organized and determine priorities. She uses reports and dashboards to track everything from user adoption to data quality. Linda has put a number of improvements in place for her end users to make their work easier, including automated processes, killer dashboards, and simplified page layouts, with the essential fields displayed at the top for quick access. Jose is your Sales Manager. He manages your top-performing team of salespeople. The salespeople who work for Jose regularly top the monthly leaderboard and go to club. To stay consistently on top of the charts, he and his team manage everything in Salesforce. Jose’s team keeps Salesforce updated throughout the day, so at any given time, Jose can look at Salesforce for the latest status on all deals in progress. Using sales dashboards, he can get an executive view of what’s in the pipeline and identify deals where a salesperson needs his support. Dashboards also give him an easy way to communicate to executive leadership at Cloud Kicks on performance to target. And that’s how Cloud Kicks has gotten to where it is today using Sales Cloud. And when Cloud Kicks is ready for more growth, the Salesforce customer success platform offers additional options. Jose has heard about Marketing Cloud and thinks it’s time for Cloud Kicks to get serious with customer journeys and more targeted email marketing. Linda recently saw a demo of Analytics Cloud and was impressed with the streamlined interface and powerful, real-time reporting capabilities. Candace has heard about Communities and thinks it may be time for Cloud Kicks to take their social presence and engagement to the next level for customers, employees, and partners. Now you’re starting to see how each team member at your company can use Salesforce CRM to achieve success. And don’t forget that Salesforce CRM is built on a platform that allows you to customize and tailor what you see here to make it work for you and your business. For example, because Linda is supporting the entire Cloud Kicks Sales team, she receives a large number of requests from Jose, from reports to data imports. It would help Linda and the sales team to have a streamlined way to make those requests right in Salesforce. Linda could create a custom Projects object to track those requests. Jose can then create a request by filling out a form, and Linda and Jose can both track the progress of each request within Salesforce. 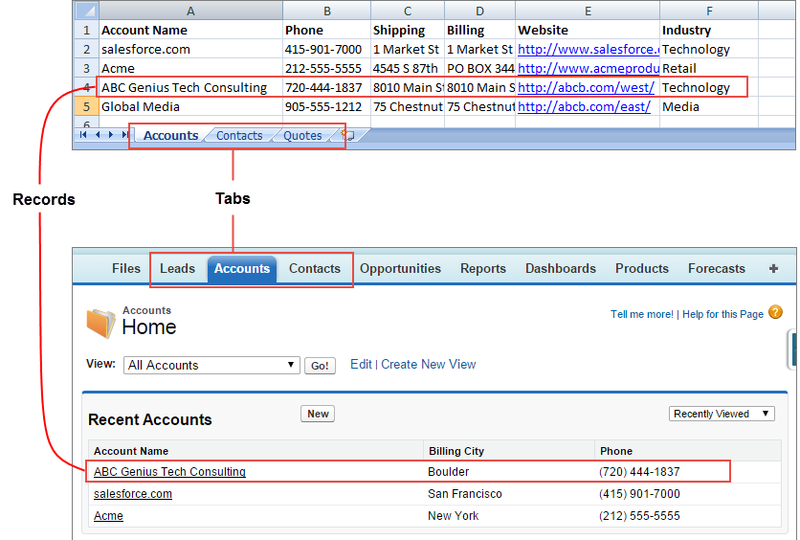 Because the custom object is in Salesforce, you can link each request to other standard objects, such as Contacts, Accounts, Leads, and Opportunities. The custom object also has access to reporting and Chatter for analysis and collaboration, respectively. For more information on adding customized functionality, check out the Trailhead Salesforce Platform Basics module . While we’re talking about Salesforce, it’s a good time to look at a few use cases for Salesforce CRM. So far we’ve been using an example of a traditional goods and services sales model, that sells a product (custom sneakers) to customers (individuals or businesses). But how does Salesforce support different industries? Now you’ve learned how Salesforce CRM and the customer success platform are your foundation for engaging with your customers. In the next unit, we’ll dive into the user interface and show you some easy customizations that you can make today.